Based on the book by Daniel Errico. Illustrations by Tiffany Turrill. The ocean floor is filled with the rarest of creatures, but none are as rare as gnarbles. Their fins are small, their tails are floppy, and they have never strayed far from their homes…until now. 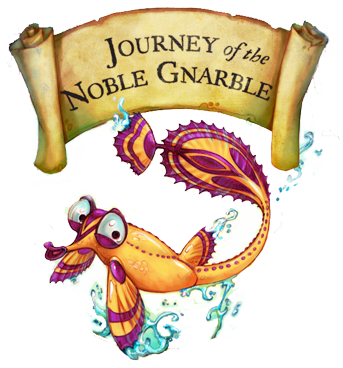 Journey of the Noble Gnarble is a story of a little gnarble with a big dream, who tries to make it past doubting blyfish, sneaky subbalubbles, and hungry plinks on his way to the surface of the sea. Along the way he befriends the glinny glims who teach him the importance of positivity and determination. This heartfelt and unforgettable journey takes you through an underwater world like you’ve never seen before! Journey of the Noble Gnarble is currently available for licensing to schools and youth theaters through Beat by Beat Press.